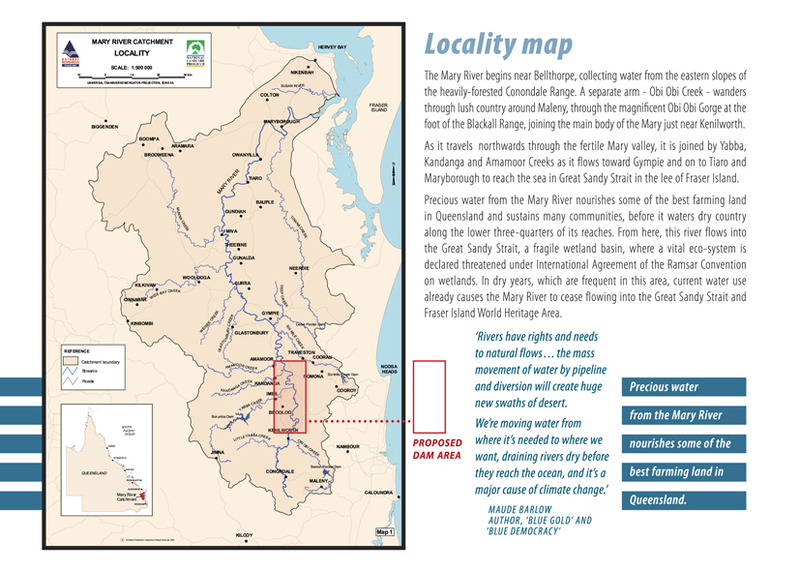 The public campaign to SaveTheMaryRiver has been running since April 2006 when the Queensland premier of the day, Peter Beattie, made a "shock and awe" media announcement of his personal committment to dam the Mary River at Traveston Crossing. Prior to this media announcement, there had been no public consultation on the proposal, no liason with local or federal government, no on-ground investigations at the damsite. Even worse, the people of the Mary River had had just gone through an extensive Water Resource Planning process, during which no discussion of this major dam proposal had arisen, as well a South East Queensland Water Supply Strategy process, during which there had been no mention at all of this proposal. On two previous occasions where this potential damsite had been formally investigated, in 1977 and in 1994, it had already been absolutely rejected. Mr Beattie's infamous media quote at the time was that the dam "will be built, feasible or not", and justified his decision with the statement "the fact of the matter is.. we are a dam-building government". Subsequent independent scientific studies and a federal senate inquiry have found against the project on environmental procedural grounds. The senate passed a motion in November 2008 calling on the State of Queensland to abandon the project. However, the Qld State government has reconfirmed it's committment to the project in parliament as recently as July 2009, and has not removed the project from it's statutary infrastructure plans released in July 2009. Here is a good summary of the public campaign this grossly ignorant and supremely arrogant approach to public planning has inflamed since 2006. The latest poll figures show 88% public opposition to the project throughout the federal Wide Bay electorate, and the last state election saw the sitting environment minister citing this project as the major reason behind the dramatic loss of his seat, (accompanied by the loss by Labor of every state electorate between the northern suburbs of Brisbane and Rockhampton). There are dozens of other good summary articles and links at the old website. Here is a brief printed summary of the main points. of argument throughout the history of the project. While you're looking around try out all the links on the left of the page - there is a wealth of information! Please make the effort to become informed, and realise that every single person can do something to help save this river for future generations. Queensland can move past the tragic results of past stupid decisions made by corrupted political processes - but only if we all take direct responsibility for the results. Why not start by acquainting yourself with some of the facts, introducing yourself to your local MP, and discussing this issue with them? (After all, It is their job to do this, and believe it or not, they're just normal people and most of them are very reasonable to deal with).